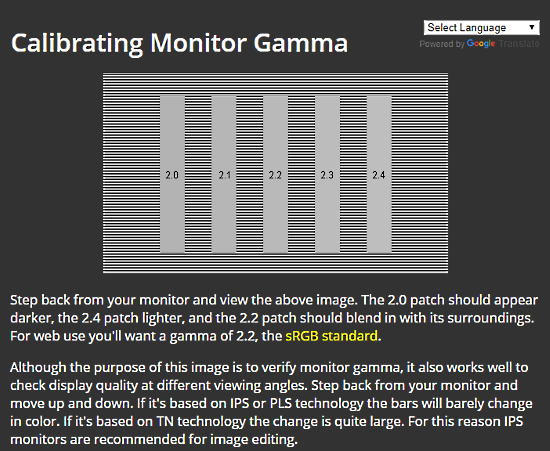 This article covers 5 free online monitor calibration tools for gamma correction. Gamma function is responsible for the luminance. If you are into displays, image accuracy, games, or editing then gamma really matters. Due to inaccurate gamma, an image may look dark or faded. It also plays an important role to produce color accuracy. The process of producing the accurate value of gamma as per a display is known as gamma calibration or gamma correction. You can read in details on gamma calibration here. Here I compiled a list of 5 online tools which can help you correct the gamma for your computer monitor. These tools provide you resources to check the gamma of your computer monitor along with guidelines. They offer different approach either to determine or correct the system gamma for your monitor. I’m covering the methods of these websites here and leave it to you to figure out which one works well for you. 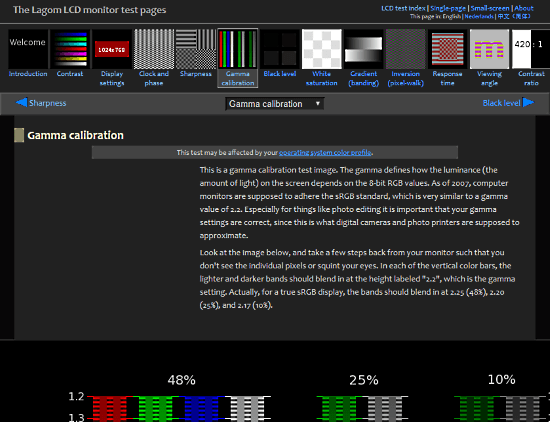 The first online monitor calibration tool for gamma correction on this list is from Lagom. It is a tool to test the LCD screens. With this tool, you can test sharpness, contrast, contrast ratio, white saturation, display settings, clock and phase, gamma calibration, black level, gradient, inversion, response time, viewing angle, and subpixel layout. The gamma calibration feature here shows a test image on your computer screen. The image has straps of red, green, blue, and grey color with different luminosity. Each color has a mixture of lighter and darker bands which should appear to blend when seeing from a distance. If this happens then the gamma value for your monitor is 2.2. If that’s not the case, you can find the gamma value with further testing and correct it accordingly. Check the gamma value of your computer monitor here. 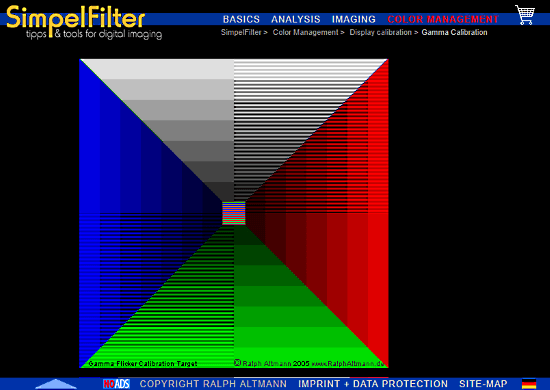 The second free online gamma calibration tool on this list is from SimpelFilter. It is a display gamma calibration tool for the gamma value 2.2. Instead of showing you separate straps of colors, this tool shows a square with all four colors (red, green, blue, and grey). This tool has three such images, two with colors and one in greyscale. All these images have subsequent lighter and darker bands with color intensity fading to dark step by step. One out of two colored image flicks and changes the bands from one section to another. This helps you easily notice the difference and hence you can easily conclude if your screen has 2.2 value gamma value or not. Calibrate your computer monitor here. Each of these options opens three images in a new tab for the respective gamma value. Each image has a grey background with colors on top. For gamma correction, simply adjust the system gamma unless the colors faint and looks grey, same as the background. This is how, you can quickly correct the gamma for cathode ray monitors. Determine the gamma value for your cathode ray screen here. The fourth online gamma calibration tool on this list is from ePaperPress. This tool shows five grey-color bars on your screen each one representing different values of gamma. The background is filled with subsequent lighter and darker bands. This tool has the 2.2 bar in the middle which is the standard gamma value for most of the computer monitor. To correct the gamma for your monitor, open this tool and start adjusting the system gamma unless the 2.2 bar completely blends with the background. When it does, the 2.0 bar would go darker and 2.4 bar would go lighter. At this point, you have successfully corrected the gamma for your computer screen. Calibrate your monitor for gamma correction here. 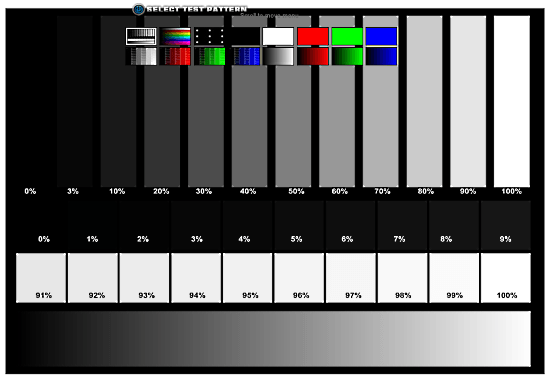 This tool shows different shades of grey in order to test out how your monitor differentiate the color shades. It divides the shades by percentage. A good monitor can easily differentiate the 2% grey shades from the proper dark. If that’s the case, your monitor is perfect, otherwise, it’s not. Test your monitor screen here. 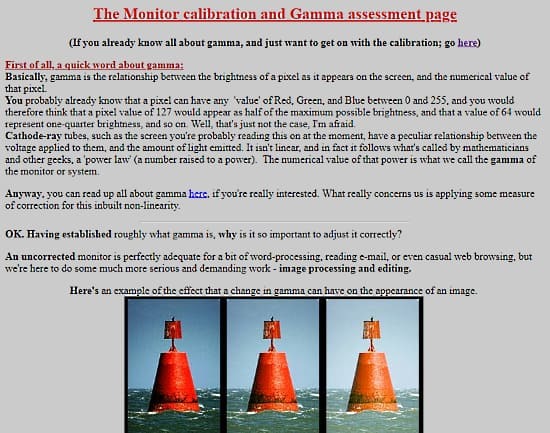 These are the 5 free online monitor calibration tools for gamma calibration. With these tools, you can verify the gamma value for your computer monitor and correct it if needed.